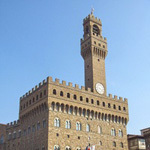 The Palazzo Vecchio is the town hall of Florence. Overlooking the Piazza della Signoria with its copy of Michelangelo's David statue as well the gallery of statues in the adjacent Loggia dei Lanzi, it is one of the most significant public places in Italy. Inside the Palazzo Vecchio, the Salone dei Cinquecento has a length of 52 m (170 ft) and is 23 m (75 ft) broad. 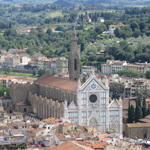 It was built in 1494 by Simone del Pollaiolo, on commission of Savonarola who, replacing the Medici after their exile as the spiritual leader of the Republic, wanted it as a seat of the Grand Council (Consiglio Maggiore) consisting of 500 members. 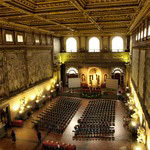 Later the hall was enlarged by Giorgio Vasari so that Grand Duke Cosimo I could hold his court in this chamber. 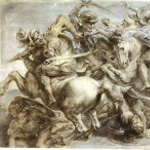 During this transformation famous (but unfinished) works were lost, including the Battle of Cascina by Michelangelo and the Battle of Anghiari by Leonardo da Vinci. Leonardo was commissioned in 1503 to paint one long wall with a battle scene celebrating a famous Florentine victory. He was always trying new methods and materials and decided to mix wax into his pigments. Leonardo had finished painting part of the wall, but it wasn't drying fast enough, so he brought in braziers stoked with hot coals to try to hurry the process. As others watched in horror, the wax in the fresco melted under the intense heat and the colors ran down the walls to puddle on the floor. 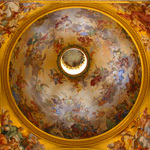 Michelangelo never even got past making the preparatory drawings for the fresco he was supposed to paint on the opposite wall-Pope Julius II called him to Rome to paint the Sistine Chapel, and the master's sketches were destroyed by eager young artists who came to study them and took away scraps. 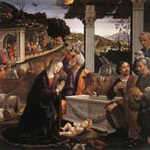 The surviving decorations in this hall were made between 1555 and 1572 by Giorgio Vasari and his helpers, among them Livio Agresti from Forlì. They mark the culmination of mannerism and make this hall the showpiece of the palace. 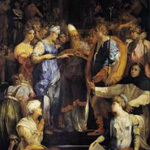 On the north side of the hall, illuminated by enormous windows, is the raised stage called the Udienza, built by Bartolommeo Bandinelli for Cosimo I to receive citizens and ambassadors. In the niches are sculptures by Bandinelli: in the center the statue of the seated "Leo X" and on the right a statue of "Charles V crowned by Clement VII". 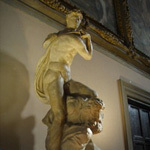 In the central niche at the south of the Hall is Michelangelo's famous marble group the "Genius of Victory" (1533-1534), originally intended for the tomb of Julius II.